In experiments at the Department of Energy's SLAC National Accelerator Laboratory, scientists were able to see the first step of a process that protects a DNA building block called thymine from sun damage: When it's hit with ultraviolet light, a single electron jumps into a slightly higher orbit around the nucleus of a single oxygen atom. This infinitesimal leap sets off a response that stretches one of thymine's chemical bonds and snaps it back into place, creating vibrations that harmlessly dissipate the energy of incoming ultraviolet light so it doesn't cause mutations. The technique used to observe this tiny switch-flip at SLAC's Linac Coherent Light Source (LCLS) X-ray free-electron laser can be applied to almost any organic molecule that responds to light – whether that light is a good thing, as in photosynthesis or human vision, or a bad thing, as in skin cancer, the scientists said. They described the study in Nature Communications today. "All of these light-sensitive organic molecules tend to absorb light in the ultraviolet. That's not only why you get sunburn, but it's also why your plastic eyeglass lenses offer some UV protection," said Phil Bucksbaum, a professor at SLAC and Stanford University and director of the Stanford PULSE Institute at SLAC. "You can even see these effects in plastic lawn furniture – after a couple of seasons it can become brittle and discolored simply due to the fact that the plastic was absorbing ultraviolet light all the time, and the way it absorbs sun results in damage to its chemical bonds." 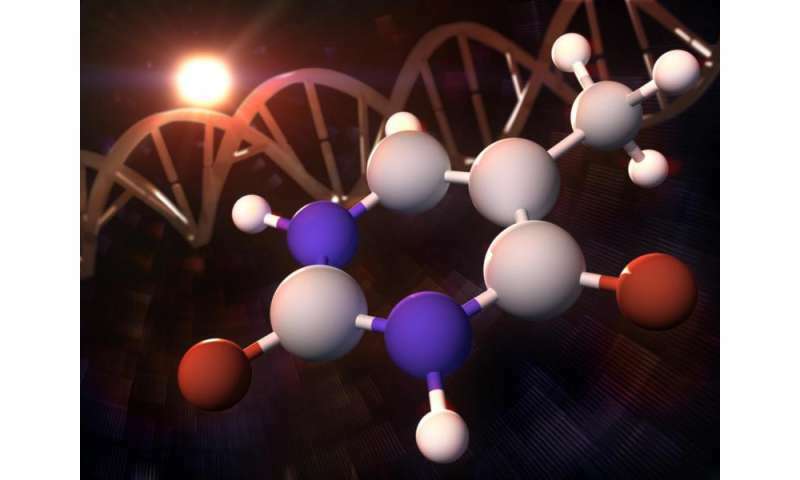 Thymine and the other three DNA building blocks also strongly absorb ultraviolet light, which can trigger mutations and skin cancer, yet these molecules seem to get by with minimal damage. In 2014, a team led by Markus Guehr – then a SLAC senior staff scientist and now on the faculty of the University of Potsdam in Germany – reported that they had found the answer: The stretch-snap of a single bond and resulting energy-dissipating vibrations, which took place within 200 femtoseconds, or millionths of a billionth of a second after UV light exposure. But what made the bond stretch? The team knew the answer had to involve electrons, which are responsible for forming, changing and breaking bonds between atoms. So they devised an ingenious way to catch the specific electron movements that trigger the protective response. It relied on the fact that electrons don't orbit an atom's nucleus in neat concentric circles, like planets orbiting a sun, but rather in fuzzy clouds that take a different shape depending on how far they are from the nucleus. Some of these orbitals are in fact like a fuzzy sphere; others look a little like barbells or the start of a balloon animal. You can see examples here. For this new experiment, the scientists hit thymine molecules with a pulse of UV laser light and tuned the energy of the LCLS X-ray laser pulses so they would home in on the response of the oxygen atom that's at one end of the stretching, snapping bond. The energy from the UV light excited one of the atom's electrons to jump into a higher orbital. This left the atom in a sort of tippy state where just a little more energy would boost a second electron into a higher orbital; and that second jump is what sets off the protective response, changing the shape of the molecule just enough to stretch the bond. The first jump, which was previously known to happen, is difficult to detect because the electron winds up in a rather diffuse orbital cloud, Guehr said. But the second, which had never been observed before, was much easier to spot because that electron ended up in an orbital with a distinctive shape that gave off a big signal. "Although this was a very tiny electron movement, the signal kind of jumped out at us in the experiment," Guehr said. "I always had a feeling this would be a strong transition, just intuitively, but when we saw this come in it was a special moment, one of the best moments an experimentalist can have." Study lead author Thomas Wolf, an associate staff scientist at SLAC, said the results should settle a longstanding debate about how long after UV exposure the protective response kicks in: It happens 60 femtoseconds after UV light hits. This time span is important, he said, because the longer the atom spends in the tippy state between the first jump and the second, the more likely it is to undergo some sort of reaction that could damage the molecule. Henrik Koch, a theorist at NTNU in Norway who was a guest professor at Stanford at the time, led the study with Guehr. He led the effort to model, understand and interpret what happened in the experiment, and he participated in it to an unusual extent, Guehr said. "He is extremely experienced in applying theory to methodology development, and he had this curiosity to bring this to our experiment," Guehr said. "He was so fascinated by this research that he did something completely untypical of a theorist – he came to LCLS, into the control room, and he wanted to see the data coming in. I found that completely amazing and very motivating. It turned out that some of my previous thinking was completely right but other aspects were completely wrong, and Henrik did the right theory at the right level so we could learn from it."